I sincerely hope that you all had a wonderful time during the festive period and also wish everyone a happy and prosperous 2017. Do you have any New Year’s photography resolutions? The purchase of some new gear? A visit to the location on your places to see? Whatever your goal, we look forward to receiving the many incredible submissions that we enjoy and publish in every issue. 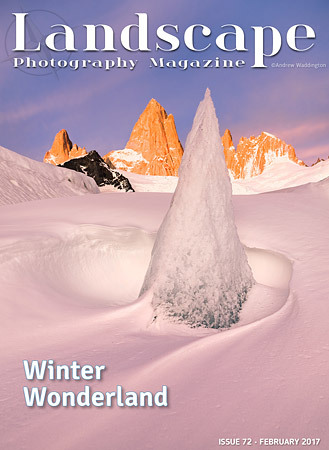 Landscape Photography Magazine has always been a publication for you, the reader. I hope what we bring to you over the next 12 months continues to inspire you. Don’t forget that submitting your work to LPM has never been easier. Every submission received is personally checked by one of the Landscape Photography Magazine team so, if you have been thinking about sending us your work, now could be the time. Just head over to http://landscapephotographymagazine.com/category/submissions/ and get in touch. As LPM launches into 2017, a recent staff meeting gave me the chance to reflect on the past 12 months. Thanks to your support, we managed to host some incredible photographers who inspire us all. Our promise to you is that we will continue doing so in 2017.